Independent Radio News launched in 1973, serving the UK’s commercial radio stations, starting with London’s LBC. The service was run by LBC, switching to the ITV new service ITN in the 1990s. The IRN service is currently operated by satellite broadcaster Sky, from studios at Sky’s Head Office near Brentford in West London, and is used by over 300 UK radio stations. IRN operates a subscription service, where stations become members and can then take advantage of the IRN reports, audio and text service. The service is also funded by “Newslink” commercials, which are transmitted alongside news reports during peak listening hours. The service is available on a subscription basis to hospital radio stations. 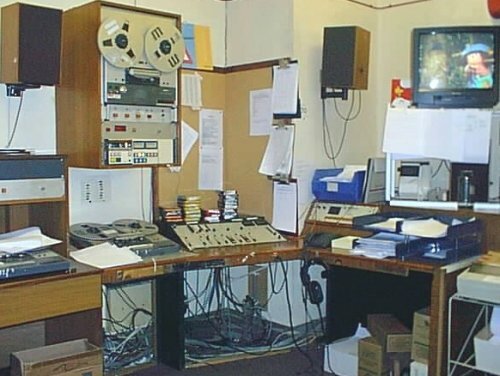 In the 1980s and 1990s, the IRN service consisted of an audio feed and a teleprinter service – The audio feed used a BT landline and news bulletins, news cuts, sports news and interviews were delivered to member stations. You can get more information, and hear the most recent news bulletin at irn.co.uk. The IRN feed is now distributed via the Astra satellite, and can be picked up by member stations using a standard satellite dish and decoder pointing at the same satellites as those used for the Sky Digital TV service. I worked for a local commercial radio station from 1985 to 1999, and IRN was an integral part of the station’s operation. One of my first jobs was as a T.O (Technical Operator), taking in the news, clock-start, into pre-recorded programmes. I also looked after the Network Chart on a Sunday, down the wire from Capital Radio’s studios via the IRN landline circuit (in glorious mono). I spent several years working with the Saturday afternoon sports team, carting up football results down the wire from IRN, or taking the 5-to-5 football results feed on a Saturday. Note the large reel-to-reel that auto-started when IRN send audio, the cart machine for capturing news clips and goal flashes, and on the right, the old trusty dot-matrix printer with rip-and-read stories churning away. If anyone is interested, please get in touch and we’ll try to dig out a few audio clips of IRN from the 80s and 90s, which we have stashed away in our audio archives! Oh what memories. In 1982/3 while working for an audio company in Windsor I started freelancing for Chiltern radio in Dunstable. Five or do years at T.O. On Saturday sport and Sunday Network chart etc. Remember checking the phase of the two legs from our local exchange. Yellow patch cord at the ready! Then a further five years or so as a freelance T.O. With LBC, first at Gough Square and then in Hammersmith. I was the last one out of Gough Sq – as some lines still appeared there and needed patching through to Hammersmith..
– and Pete Murray nicking my smokes when he was on lates….and Bill Bingham and faces to all the iconic voices. Happy days indeed. I was a TO for Essex Radio from 1985 onwards, often on the other end of the IRN feed, carting up clips for the evening news or the sport show. I also TO’ed the sport and the chart show for a while, as well as many other shifts. Ahh, the yellow phase-shifters! Other memories for me – piles of razor blades, plus cotton buds to clean the revox heads, the 4:55 classifieds, and changing the logging reel-to-reels so we’d never miss a cut.